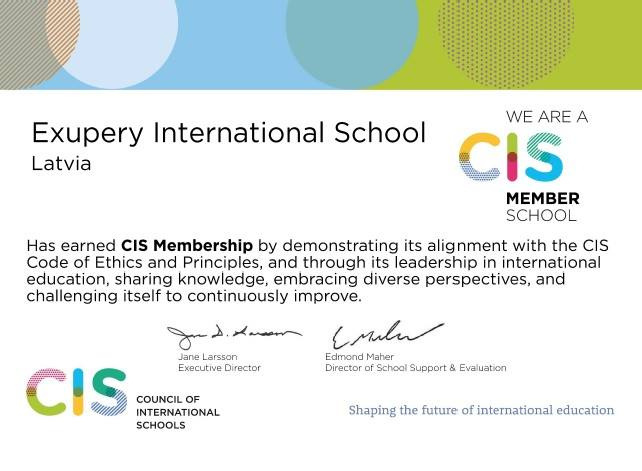 We are excited to announce that Exupery International School (EIS) has been granted membership of the Council of International Schools (CIS). The CIS represents a prestigious body of schools committed to providing high-quality, progressive education in a globally-conscious environment. With CIS support, the experiences and learning provided by Exupery International School will open even more doors for our graduates and current students. a state-of-the-art building and well-resourced and maintained facilities which are both aesthetically pleasing and conducive to the atmosphere of contemporary learning. collaboration and networking opportunities with international educators around the world. We congratulate everyone at our school on their commitment to the shared vision held by CIS school members around the world: a desire to provide students with high-quality education that fosters the knowledge, skills, and abilities necessary to pursue lives as global citizens.